I’ve been to Yulla, a Japanese restaurant at 1 Richmond St. W. in Toronto, so I can tell you they’re more than just a pretty face–the food is delicious and there’s a lot of love in it. But I’ll admit, I’m partly into them for their looks. The owner is an artist and that some of the artwork on the wall is theirs. 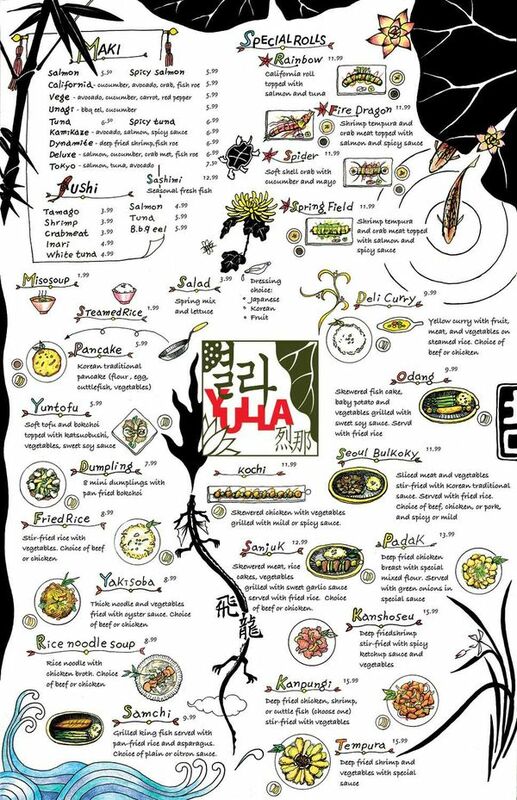 They illustrated the beautiful menu, you see above. Musing over it an exercise in concentration. I’m happily distracted by the charming illustrations while I’m eyeing the soul-nurturing, mouth-watering menu options, and vice versa. Sigh. Illustrators make it look so easy!